An approach is described for the detection of a unique sequence, the T-DNA region of the Agrobacterium rhizogenes root-inducing (Ri) plasmid, in plant chromosomes by in situ hybridization. This sequence was introduced into the Crepis capillaris genome (2n=6) by infecting Crepis stem segments with A. rhizogenes. Roots growing from the infection site contain T-DNA and synthesize mannopine, which can be used as a convenient biochemical marker for T-DNA transformation. Southern analysis of DNA isolated from one transformed Crepis root line verified the presence of a single copy of T-DNA (approximate size 17 kb) per diploid Crepis genome. To localize T-DNA, both DNA and RNA probes, labelled with either tritium or biotin, were hybridized to Crepis chromosomes prepared from transformed root tips by a novel spreading method. Biotinylated probes were visualized using reflection-contrast microscopy. 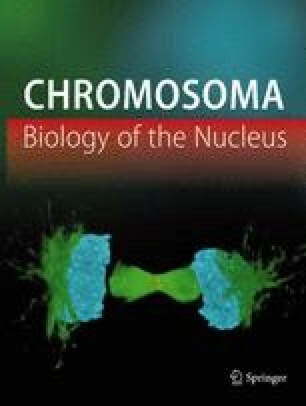 In the hybridization experiments described, T-DNA was detected in one homologue of chromosome 3, where it could be assigned to a paracentromeric position in the neighbourhood of the nucleolar organizing region. These results demonstrate that it is possible to localize unique sequences in plant chromosomes by in situ hybridization.